Delicious milk chocolate balls filled with Amarula® milk chocolate ganache. 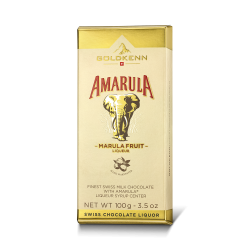 sugar, cocoa butter, whole MILK powder, Amarula 8% (marula fruit and cane spirits, water, natural flavouring, colouring (E150d)), inverted sugar syrup, cocoa mass, BUTTER, humectant (sorbitol), glucose syrup, SOYA flour, emulsifier (soya lecithin), concentrated lemon juice, salt, natural flavourings (with vanilla), colouring (E150a). Cocoa: 35% min. in chocolate. Contains soya, milk. May contain almonds, hazelnuts.